Fall is the season for putting up Halloween décor, but I have never been a big fan of the spiders and bats. Until this year, I've ever done anything for fall decorating except to replace my summer flowers with cooler weather mums. This year there has been a lot of inspiration around my neighborhood and town that prompted me to put a bit more than just new Fall plants. I planted my usual mums and an added decorative kale, but this with an old metal bucket, some rocks on the bottom and potting soil, it was done. I also bought some pumpkins that were being sold at a local store. Instead of just leaving them as is or cutting them, I decided to fancy them up and make them glow in the dark. This was an inspiration from thinkcrafts.com. 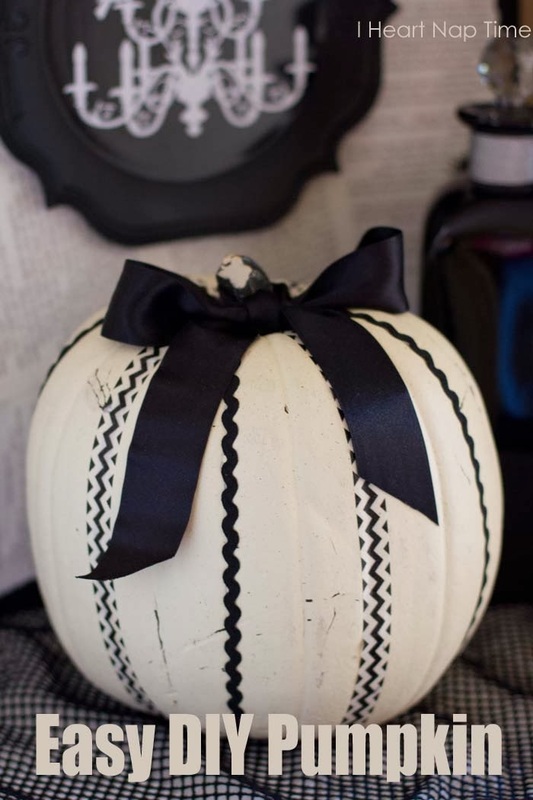 They took a red glow in the dark black puff paint and dotted designs all around each pumpkin. I was unable to find black glow in the dark so I used the regular black and alternated it with a red glow in the dark puff paint. To be honest, they don't glow in the dark that much, but they do look cool. I also used the same puff paint to outline our last name initial on another pumpkin.. The Y isn't quite visible to see from the street, but up close to the front door you can see the decorated pumpkins. Add a simple bail of straw, arrange everything and you have fall on your door step. Now, all we need is some more colored falling leaves and cooler temps. Though, I'm not complaining. There have been tons of inspirations for pumpkin decorations. 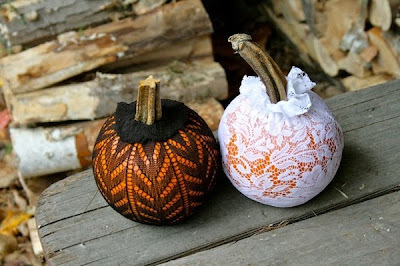 If I had some old patterned stockings, they can be used to cover a pumpkin (see below), but my frugalness wouldn't allow me to use any of my good pairs. Another inspiration is from I Heart Nap Time. The steps call for a fake pumpkin, but I am sure you can use a real one. Use some white paint (or a white pumpkin), washi tape, and other decorative items and you are set. This ironing board cover was totally made out of frustration because I was unable to find the cover I really wanted for my small ironing board. The search went on for a few weeks and I did find a few good options but wasn’t willing to spend $20+ bucks on a cover that would cost more than the actual ironing board! So, I decided that I would DIY my own cover. 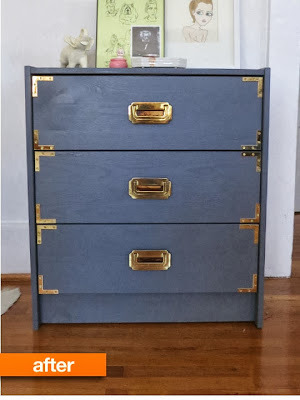 This DIY project was not an original thought either. The complete tutorial is from Desiree from The 36th Avenue blog. Her tutorial made me want to make my own to save money and also pumped me up to take another chance to improve upon my weak sewing skills. She is totally right, don't say you can't sew until you actually take a chance. For this project I decided to use the same fabric I chose for another project you will see soon that also was made for the laundry room. The process was pretty easy and it took just a short amount of time (about 20 minutes) compared to the amount of time I spent actually searching online and in stores. I left the original cover on the ironing board because it had the cushion attached to it. Check out Desiree' blog for all the steps. Just a hint, make sure you leave enough room on the sides for the fabric to really wrap under the ironing board so when you pull the sides tight with the elastic it will grip underneath. If you don’t give yourself enough overlap, the cover won't hold onto the actual board. This is totally a DIY for a larger board as well. Of course it will take longer, but totally worth it. Look how much cuter my ironing board looks now! Just make sure you use thicker elastic. You might want to use two pieces of elastic and have two sections where it is pulled taught instead of one like on my smaller board. 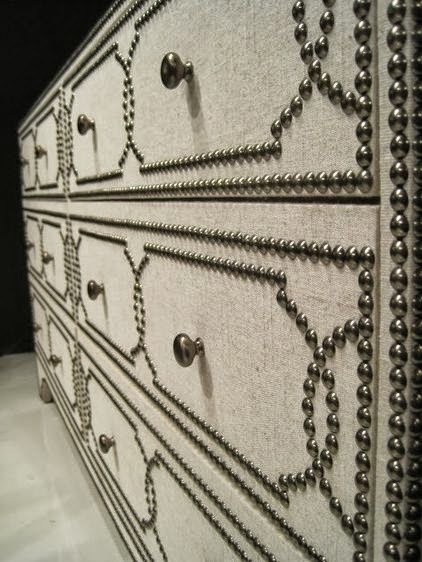 Is your ironing board boring? Make a new cover and make it fancy. Cleaning your makeup brushes is really important. They get full or bacteria if they aren’t cleaned regulalry. If you are like me, you might wear makeup everyday and use your brushes often. A while back I showed you how to do a weekly deep clean on your brushes. That method is great to use about once a week, depending on the frequency of your brush use. But what about a daily clean? I recently started applying a gel eyeliner with a brush instead of using liquid or pencils. I like the look a lot better and it stays on much longer for me using this method. Because I am using a brush, I have to clean it after each use or it will be hard as a rock the next time I use it. I needed a daily cleaner. I got this recipe from the Get Clean Girls blog. It was changed a bit because I didn’t have all the ingredients, but it is basically the same easy idea. I used distilled water, isopropyl alcohol, witch hazel, olive oil and rose water. Fill a spray bottle halfway with the alcohol, half of the remaining space (1/4 of bottle) with the distilled water and the remaining amount of the bottle with the witch hazel. Save room for just a little olive oil and rose water. The rose water was added because it is a natural fragrance, which cancels the smell of the witch hazel and can be known to moisturize. You can also use lavender oil and/or tea tree oil. Shake it up before each use. Use a clean washcloth to clean brushes after each use and allow them to dry. Baking is not my thing. Case in point when baking these muffins Sunday morning I dropped an egg on the floor, couldn't find any measuring cups, and then dropped half my cream cheese frosting on the floor. I should not bake, but these muffins are really too easy and too tasty to not make. Naturally, I took a shortcut. 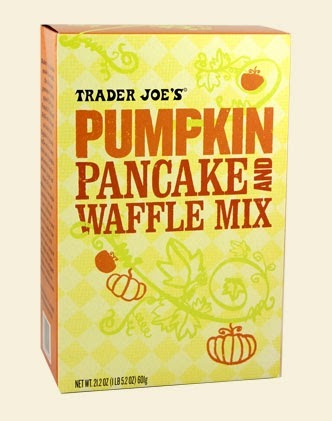 Instead of measuring out all of the dry ingredients, I cheated and used a store bought box of pumpkin pancake/waffle mix as my base. There was no need to measure all those ingredients when I had the base right there in my pantry. You can use any dry mix base for this recipe, but just realize that you might need to add a little more wet ingredients to get the right lumpy consistency for muffins. My recipe is not an exact science because the Trader Joe’s mix I used is not like the others. 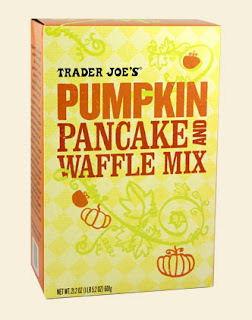 If you are lucky enough to get some TJ’s pumpkin pancake/waffle mix, buy a few boxes, its A-MAZING! Preheat the oven to 400 degrees F. Line a muffin tin with liners and then spray with non-stick cooking spray. In a small bowl whisk wet ingredients; egg, oil, pumpkin. In a separate larger bowl combine all dry ingredients; pancake mix, sugar, cinnamon, and nutmeg. Pour the wet ingredients into the dry ingredients and combine. Do not over mix, but make sure that there are no dry ingredients incorporated. Drop the batter into the lined muffin tin about ¾ full. I usually go a bit over because I like really big muffins. Bake for about 15-20 minutes until a toothpick comes out clean. Let them rest out of the muffin tin before topping with cream cheese frosting. Let the cream cheese and butter sit out until they soften to room temperature. Using an electric mixer, mix the cream cheese and butter together. Mixing on low, slowly add the sugar to incorporate. Then mix in the vanilla, cinnamon and nutmeg. Put mixture into a pastry bag or plastic bag with corner cut to top the muffins. Wait until the muffins have cooled so that the frosting does not melt. Last year I showed you how to organize your scarves. I also used the same organizer for under bed boot storage. Well, I now am lucky enough to have a closet that is large enough to store all of my clothing, shoes and accessories in one place. I originally kept my scarves in the organizer under the bed after we moved, but in the early morning hours after almost tripping over it and almost spilling coffee all over the place I figured it was time for a change. It turns out that I didn’t shove the scarf storage fully back under the bed after I took out my colorful accessory... blame it on pre-coffee brain! I decided to put my scarves back on the their original holder, the IKEA Komplement that I originally bought many many many years ago. It does what it was suited for, holds scarves, all 26 of mine. I don't see what this as a problem, do you? Now, what to do with the organizer? After a few days of thinking, I realized that my underbed storage for gift wrapping supplies was just overflowing and needed a little help. It is stored in the guest rooms so it doesn’t really bother me, but I know when it is prime birthday or holiday season I always cringe when it comes time to find stuff. I left all of the wrapping paper and tissue paper (I didn’t realized I had so much) in the original Tupperware holder. The other stuff; ribbon, bags, bows, stuffing, etc. got organized into the little compartments that were intended to hold shoes. I felt the bottom needed more structure so I cut the plastic and slid a piece of foam board to keep the bottom sturdy. You can also cut pieces of cardboard from a box. I already had a piece of foamboard left over from another project. I ended up cutting a few section dividers out to store all of my bags in organized piles according to occasion. I use clips to keep them stacked together. This couldn’t be easier to repurpose this under bed shoe storage again. I love when a project doesn’t cost a penny, but it was worth all the effort.